Whenever I ask people if they’ve ever had a stressful relationship at work, they all tell me yes. Just asking the question can have us relive the stress and discomfort a bad relationship creates. Poor relationship chemistry at work has us over-think, underperform, and trigger the anger or upset that leads to poor business decisions. The good news is an executive can learn to authentically connect to the values they have in common with the people at work. This results in everyone becoming more productive, innovative, and inspired to do their job; a win-win-win solution. All executives are limited to use the success formulas they always use to improve relationship chemistry, achieving limited results at best. Without developing new relationship formulas that are targeted to succeed they will get easily frustrated, resulting in weaker productivity. Values dictate our call to action and when they are not honored that action becomes hard and tiring. When a senior executive is coached to authentically connect to their values and the values they have in common with peers and employees’, work becomes inspiring. Talent is a company’s most important asset to invest in. The return on a company’s bottom line can easily reach 10 times the cost of coaching and greater. For over 20 years I have been working with thousands of executives advising them how to better work together. 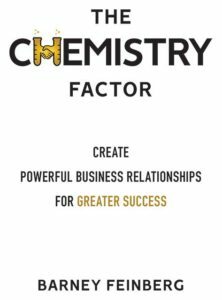 The Chemistry Factor is a program born out of a synergy between executive placement and executive coaching, creating the chemistry that inspires great relationships. Ignite the chemistry in your company! Visit our Who We Work With page to discover how we can help you create great business relationships in your company with anyone, anywhere, anytime. Visit our Who We Serve page to discover how you can create great business relationships in your company with anyone, anywhere and at anytime. “When asked what the most important aspect in the success of a business is, I say, “It’s all about relationship chemistry.” The stronger the relationships are in a company the more productive, innovative, and proactive it will be. If relationships with the people at work are difficult and uncomfortable, their motivation to do their job will be more difficult and uncomfortable as well.